Each summer, families spend countless hours at the pool in the sun. While pools are meant to be a fun summer amenity, they can pose numerous threats if used without caution. Whether you are swimming in your own backyard or at a communal pool, stay safe this summer with these pool safety tips. Is the pool fenced in? Whether in a yard or a communal setting, pools should always be surrounded by a gated fence. This will prevent young children from entering the pool area without an adult, keeping them from a potentially dangerous situation. Is there a lifeguard on duty? Lifeguards are trained to react quickly to emergency situations in and around a pool, should they occur. Check to see if a lifeguard is on duty prior to entering the pool. If a lifeguard is not present, observe all posted pool rules and carefully swim at your own risk. Is there life-saving equipment nearby? Whether there is a lifeguard on duty or you are swimming at your own risk, check to make sure there are lifesaving equipment such as a life ring or buoys by the pool. These tools can be the difference between life and death and should be used in an emergency situation. Can you and/or your child swim? Know your child’s skill level, as well as your own. If your child has trouble swimming, get in the pool with them to prevent them from going under. Equip your child with a life vest or other floating devices, if necessary. If you yourself have trouble swimming, keep to the shallow end of the pool where you can stand. Is the weather appropriate? Mild, sunny days provide the best swimming conditions. Be sure to apply sunscreen to prevent skin damage and re-apply every 30 to 60 minutes. If there are clouds in the sky, be aware of potential thunder storms. If lightening strikes or thunder is heard, be sure to remove yourself and your children from the pool area immediately. Are the pool’s chemical levels appropriate? Check the levels of chlorine and other chemicals to ensure the pool water is safe. Also check the filtration systems and circulation of the water to ensure its cleanliness. Are there rules in place? Be sure to follow all posted rules, particularly in communal settings. If you are swimming in a personal pool, observe common sense. 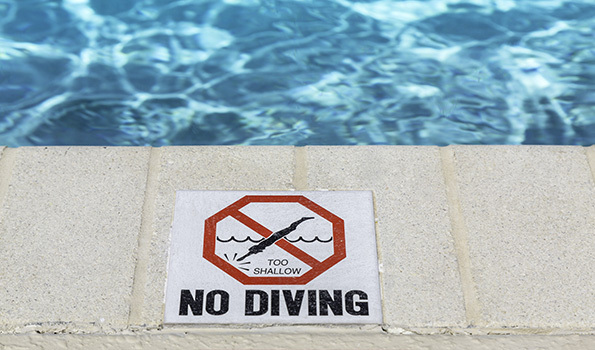 For example, do not dive in shallow areas of the pool. Rough housing should not be tolerated, running around the pool area should be avoided, and proper swimwear should be worn at all times. If swimming with small children, be sure they are aware of the rules and the consequences of breaking them. Remember that pool safety is the responsibility of everyone. Reduce the risk of injury this summer by following these pool safety tips.